Holy crap, did I hit paydirt! "Marc (sic) - you can go in and any one that is assigned to me other than the bigfoot one I have with Kxxx you can have - just let me know the number and I'll go in and transfer it., Thank you so much!" I'm ecstatic! But I'm also pissed! I don't get the Bigfoot case???? It's right in my freaking County and I don't get the Bigfoot case???? Oh well. Hollering about isn't going to change anything. Let Vxxxx keep the Bigfoot case; he's in my county so there's no reason I can't go cruising for Bigfoot on my own time, anytime I want, without having to ask anyone's permission. 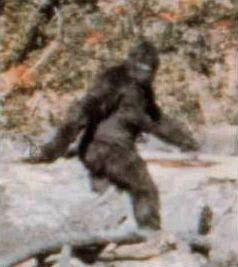 Apparently Bigfoot has been sighted in my County in Wisconsin, and nobody knows about it. Why has there been nothing in the local paper? Wake up, people! For starters, there's the recent sighting report from a city not far from here that begins, "My son and I observed two strange crafts hovering to the northwest, objects hovered and then one took a a path change with amazing speed..."
That's tempting (multiple witnesses! ), but then there's this: "They were life forms that trapped me in my deer hunting stand and toyed with me." Hell-o! Life forms that trapped a deer hunter in his stand and toyed with him? How can I pass that up? How is it that this case hasn't received national headlines? It's a flipping CE4!!! A Close Encounter of the Fourth Kind! That's called an "Abduction," kids, and cases don't get any juicier than that. Not only that, but the irony of the hunter becoming the hunted... the toyer-with becoming the toyed-with... it's just too rich. I must investigate this case.